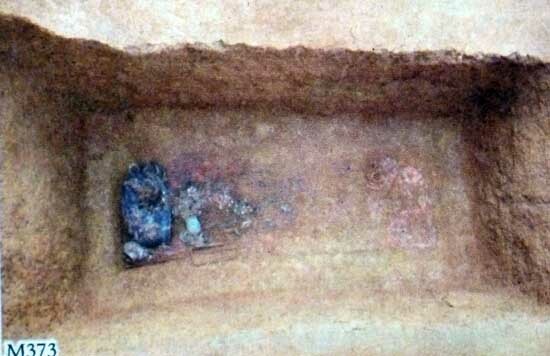 Liaojiaping (Chine): two tombs could be dated back to Han Dynasties. The Liaojiaping site is located at the Nongchang village, Kele Township in Hezhang County, Guizhou province, about 2 km from the township resident. Cooperated with infrastructure construction, the site has been excavated during July to September 2011 by Guizhou Provincial Cultural Relics and Archaeological Institute. The uncovered area, totaled 1,000 square meters yields houses, ash pits, kitchen ranges and ditches, as well as two tombs. The yielded finds include 37 ash pits, 11 ditches, 134 post holes, 3 kitchen ranges and 1 burnt remains. In strata various objects have been found, such as stone tools, ceramics, bronze and iron wares. While the cultural contents seem a little bit simple; they could be dated back to Han Dynasties. The two tombs, numbered M373 and M374 respectively, are the most important achievement in the rescued excavation. They are arranged side by side, spaced less than 5 m apart. The tomb M373 is in the shape of a rectangular shaft earth pit, with the head end toward 170°. In the filling earth there are a lot red burnt earthen lumps. The tomb measures 2.5 m long, 1.1-1.3 m wide and 0.95-1.7 m deep. Its bottom is 2.5 m long and 1.1-1.3 m wide. The four walls of the tomb are basically upright except that the north side is a little slant. The bottom, with the south end wider than the north, is roughly horizontal. Due to the local acid soil all human bones and coffins are eroded seriously, only left some fragments or traces. Judged from the wood fragments above the large sized bronze cauldron and black wooden traces at the left side of the pit which measuring ca. 60 cm long, a wooden coffin could be supposedly used. The human skeleton, probably buried with extend supine position, only remains a part of skull, a jawbone, some teeth, ribs and backbones. The tomb M373 contains a skeleton with extend supine position and with a bronze cauldron covering the head. In the cauldron near the mouth there is a hairpin. The jawbone, partially covered by the cauldron, is found 5 cm below the cauldron’s mouth. Under the jawbone another hairpin is found. Therefore it seems that the cauldron is placed not to contain the whole head, but to resemble a cap. Inside the cauldron textile traces are found, supposedly used to wrap the head. The burial objects total 70, including various objects made of ceramic, bronze, iron, bone, lacquer, semi-precious stone, seashell and agate. It is the hitherto found richest type II tombs at Kele. The tomb M374 is a rectangular shaft earth pit with the head end toward 174°. The opening remains 3.5 m long and 2 m wide, and the bottom 3.5 m long, 2-2.1 m wide and 1.2 m deep. The four walls are all upright. The pit is filled with reddish brown earth mixed with yellow clay, containing red burnt earthen lumps and carbon dusts. Surrounding the central coffin traces on the bottom there are four linked ditches which could be remaining of an outer coffin. Considering some wooden fragments found in the filling earth, the wooden coffins could be reconstructed. The burial position of the deceased is unknown. The burial objects total more than 20, including various objects made of iron, bronze, jade, glass, lacquer and semi-precious stone.